Google Maps for iOS is out, free, beautiful, and comes with turn-by-turn directions. This is the day a lot of people have been waiting for ever since Apple abandoned Google's beloved service in iOS 6. What a turn of events, particularly considering Google's app includes voice guided turn-by-turn driving directions. Holy moly. I've been unable to download the app myself, but that's likely because it's still rolling out, taking its time to register in Apple's store. But it's there, just as the many rumors said. Download it. Get it before the stars burn out and the world implodes. This is the app iOS users, even when Google was providing maps for Apple, wanted all along. Features include Street View, public transit (train, bus, subway, and walking), the ability to sync between phone and computer, live traffic info, building tours and a streamlined interface that is familiar, like seeing an old friend. Once the download goes through we'll be able to give you a better idea of how the app works, how it performs, and if it's any good. Right now it's a big tease, sitting there in front of our eyes. Google said the company started working on the app this year, but refrained from saying whether it coincided with this summer's breakup with Apple. Whatever the case may be, the app is by all accounts very pleasing to use, and possibly the best version available on any OS — that includes Android. What Google has done, according to The Verge, is utilize vector graphics to create a fully-native fluid experience. Faster, cleaner, better load times, which translates to a more pleasing overall experience. 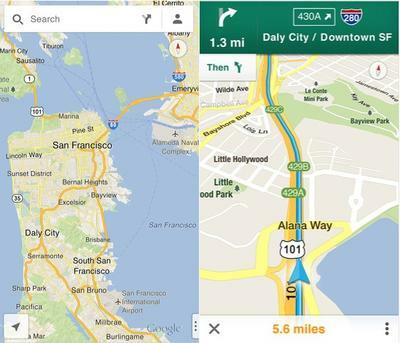 Daniel Graf, Director of Google Maps for Mobile, actually said the company took a step back from its earlier creations and approached it with a fresher, more streamlined outlook. That means a more elegant interface, all from scratch. Google's insane amounts of mapping data wrapped up in a nice package, optimized for the iPhone 5 (but available for devices running iOS 5.1 and up). The Verge said Google is actually providing two API options for developers of other apps. The first will allow developers to link addresses to Google Maps, while the second is for third-party developers to fully integrate the search giant's new creation instead of Apple Maps. This is maybe the biggest and most interesting tidbit: There will be an effort to maintain parity between iOS and Android on any future version of Google Maps. That means what Android users get, iOS users get, and visa versa.